Throughout a long career in the health and fitness industry, MARK SISSON, a former world-class endurance athlete and one of the leading voices of the burgeoning evolutionary health movement, has been on a quest to discover the true key to health, fitness, and weight loss. 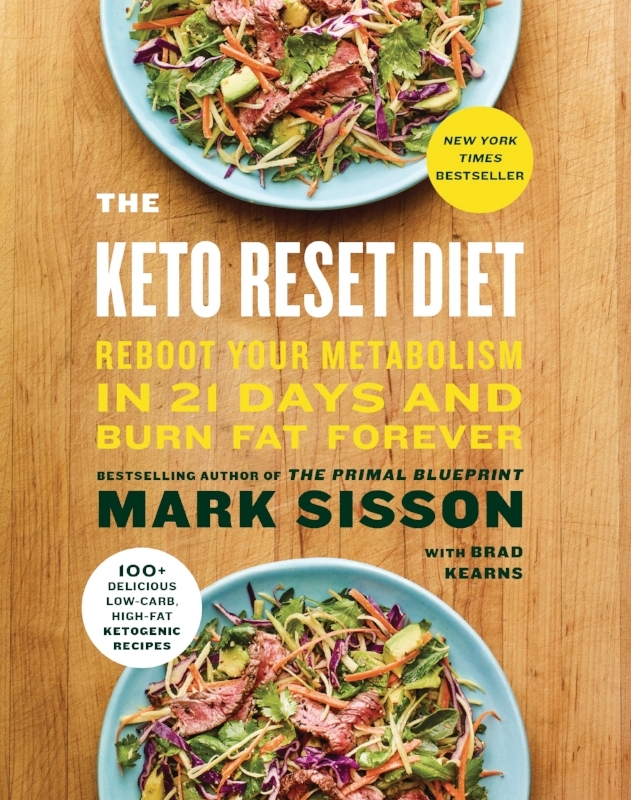 In THE KETO RESET DIET: Reboot Your Metabolism in 21 Days and Burn Fat Forever he lays out what he genuinely believes could be the greatest breakthrough in the history of dieting and nutrition. Sisson has perfected a revolutionary new way to stimulate successful long-term fat loss and weight management, and urges readers to ditch the disastrous modern diet in favor of optimal health, wellness, and what he calls metabolic flexibility. What is keto? “Keto” is a catch-all nickname for anything pertaining to the metabolic state of ketosis. Ketosis is a delicate and highly specialized internal metabolic process in which the body burns stored fat and the liver manufactures ketones for use as energy instead of glucose. Ketosis can be achieved through an ultra-low-carb, moderate-protein, and high-fat diet. The ketogenic diet has become an extremely popular health trend, but since it is an extreme departure from the typical modern diet, many people struggle to reach goals due to misguided shortcut approaches. Knowing the right way to go keto is critical to attaining metabolic and hormonal benefits. THE KETO RESET DIET will help readers progress smoothly toward the ultimate goal of becoming fat- and keto-adapted—better able to effortlessly burn internal sources of energy and escape dependency on dietary carbohydrates. With THE KETO RESET DIET, Sisson has created a healthy lifelong eating strategy that encourages varied and abundant eating of fresh, colorful vegetables, nutrient-dense fats, proteins and carbs—as well as avoiding unhealthy processed foods. The book includes over 100 delicious keto-friendly recipes including Egg Muffins in Ham Cups, One-Pan Shrimp and Asparagus, Antipasto Skewers, Seared Ahi with Herb and Lime Dressing, Sausage, Kale, and Goat Cheese Frittata. Results are immediate in the form of more energy and a regulated appetite. Dieters are likely to notice immediate weight loss and it is not uncommon for devoted enthusiasts to drop 10 to 15 pounds total, including 3 to 6 pounds of excess body fat, during a 21-Day Metabolism Reset.